Stages of Transmutation: Science Fiction, Biology, and Environmental Posthumanism develops the theoretical perspective of environmental posthumanism through analyses of acclaimed science fiction novels by Greg Bear, Octavia Butler, Kim Stanley Robinson, and Jeff VanderMeer, in which the human species suddenly transforms in response to new or changing environments. Narrating dramatic ecological events of human-to-nonhuman encounter, invasion, and transmutation, these novels allow the reader to understand the planet as an unstable stage for evolution and the human body as a home for bacteria and viruses. Idema argues that by drawing tension from biological theories of interaction and emergence (e.g. symbiogenesis, epigenetics), these works unsettle conventional relations among characters, technologies, story-worlds, and emplotment, refiguring the psychosocial work of the novel as always already biophysical. Problematizing a desire to compartmentalize and control life as the property of human subjects, these novels imagine life as an environmentally mediated, staged event that enlists human and nonhuman actors. 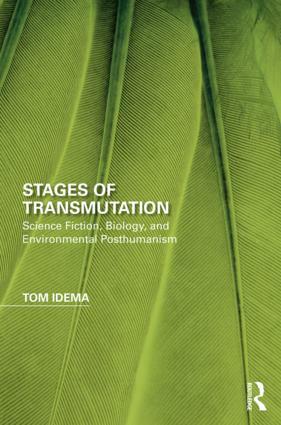 Idema demonstrates how literary narratives of transmutation render biological lessons of environmental instability and ecological interdependence both meaningful and urgent—a vital task in a time of mass extinction, hyperpollution, and climate change. This volume is an important intervention for scholars of the environmental humanities, posthumanism, literature and science, and science and technology studies. Tom Idema is a lecturer in the Department of Comparative Literature at Utrecht University, working at the intersections of literary studies, environmental humanities, and science and technology studies. His work has appeared in edited volumes and journals including Frame, Configurations, Bulletin of Science, Technology and Society, Biosocieties, and Ecozon@. In recent years, many disciplines within the humanities have become increasingly concerned with non-human actors and entities. The environment, animals, machines, objects, weather, and other non-human beings and things have taken center stage to challenge assumptions about what we have traditionally called "the human." Informed by theoretical approaches like posthumanism, the new materialisms, (including Actor Network Theory, Object-Oriented Ontology, and similar approaches) ecocriticism, and critical animal studies, such scholarship has until now had no separate and identifiable collective home at an academic press. This series will provide that home, publishing work that shares a concern with the non-human in literary and cultural studies. The series invites single-authored books and essay collections that focus primarily on literary texts, but from an interdisciplinary, theoretically-informed perspective; it will include work that crosses geographical and period boundaries. Titles are characterized by dynamic interventions into established subjects and innovative studies on emerging topics.